Did you ever search for that perfect movie watching pal, or the best bed mate? Have you been keeping an eye out for that "just right" addition to your perfect room design? Have you ever wondered if there was a "Mr. Right Monster" out there for you? There is. Each pillow has a matching fabric back that allows you to use either side as the front. Protector on the bed to scare the closet dwellers, or the fur trimmed bright color accent pillow for the couch, the choice is yours. Our pillows are made with the same high quality fur that all of our furry creations are made with so they are as soft and cuddly as possible (no actual super crazy colored animals were harmed in the making of any of our creations). These best friend protectors are approximately 14"x14", but different length furs can add to all over size. 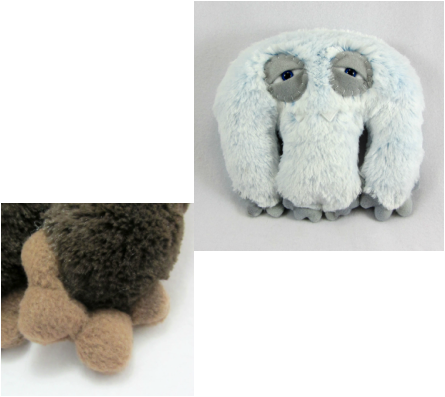 See a fur you like as you look around, here or on our Etsy site, and want one of our creatures out of that fur? Contact us and let us know. Not all furs are in stock, or available anymore, but we will do our best to connect you and your monster. Here is a monster with a little more of a clingy personality. This 5 legged monster is all about holding onto whatever it finds. 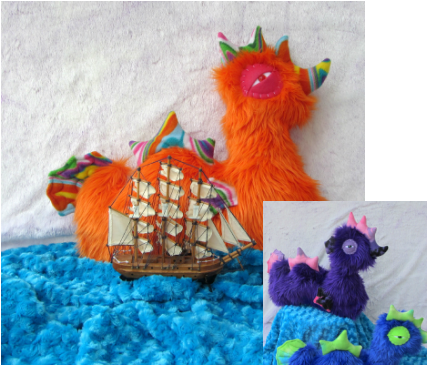 The two front tentacles are optimally curved for taking down pirate ships, and giving the best hugs. Lover or fighter? Both. And aren't you glad? A new creature has been discovered living in the frigid waters off of Siberia. This new zoological discovery has been dubbed a Siberian Splash Beast due to it's playful nature and desire to soak everyone in the boat. Not much is yet known about this furry sea creature, but it is believed that it is a hybrid between a Loch Ness Monster and a Sasquatch, because of the fur. Do you have a Kindle, iPad, NOOK or laptop that needs to stand out from the crowd? How about a Monster Cover for your device? Each cover has a protective layer of foam in addition to the thick fur to help pad your device while also making it the coolest one out there. Your device slides and the flap has a large strip of velcro to secure it shut. 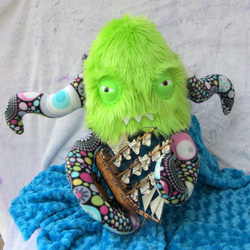 Contact us and we will get started designing your monster. 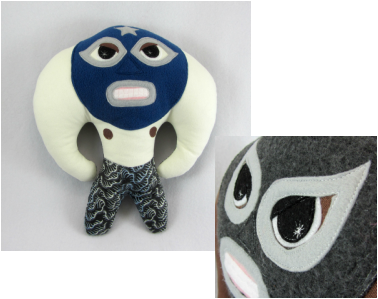 Need a fellow wrestler to practice your latest high-flying moves with? This seasoned pro is the man for the job. With the latest tight pants and biggest arms on the planet he can have your back in any tag-team match. This lovable little band of creatures made their way into our fold after one of them wandered to close to a coffee house and picked up free wifi. While searching the web on his smart phone he found our sight and decided that our monsters seemed to be the kind of new friends that he has been looking for. He sent the message out to all the Yetis, Bigfoots and Sasquatches that he knew and we have been flooded with new visitors ever since. This band of merry misfits are our Peeps, our People, our Monster People, our Meeples...get where were going with that? 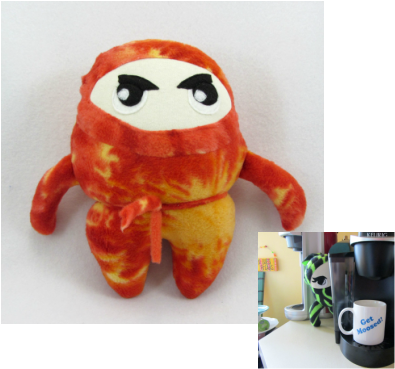 :) All three versions of these Meeples are super lovable and crazy. The tail on the back helps these monsters stand on their own two feet, now where they go with those feet is a little hard to tell sometimes. It has been awhile since Ninja Union 485 has had a lot of work. In today's socioeconomic climate ninjas just don't get the calls that they used to. Lawyers and computer hackers seem to be taking away a lot of the opportunities that these guys used to get. As a result of their slow down in work obligations they have sort of plumped up a little, and have packed on a few pounds. Don't let the cute belly fool you, they are still the stealthy attack artists they always were. So, if you have a secret job that need to be carried out, and you just think you need a little help, these guys are the professionals for you. Have you ever wondered where some of our monsters come from? Have you just had to know where they come from, and what they were like in their younger years? Well, here they are. These our are Baby Monsters these cute little puff balls of loveliness are the perfect starter monster if you don't know which one is perfect for you. This Monster Wallet is a great way to have a little extra protection for your hard earned cash. There huge eyes and scary teeth are sure to frighten away even the most ferocious burglars, mostly because they won't know what it is! Our wallets is made with faux fur (no actual super crazy colored animals were harmed in the making of these wallet). There are 10 credit card slots, that can hold more than one card each, and two pockets large enough to hold your cash, receipts, and a checkbook. Once we decided to start making hats the next logical step was to make scarves. These long, furry, warm scarves feel like a monster hug of happiness that will keep you warm all winter long. 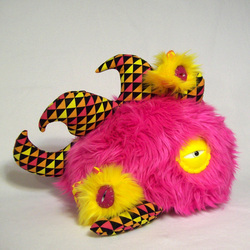 These monsters are specifically made to brighten up the dreary winter days that are threatening the horizon. Not only will they keep you warm and make you smile but they will bring joy and delight to all the people you meet! 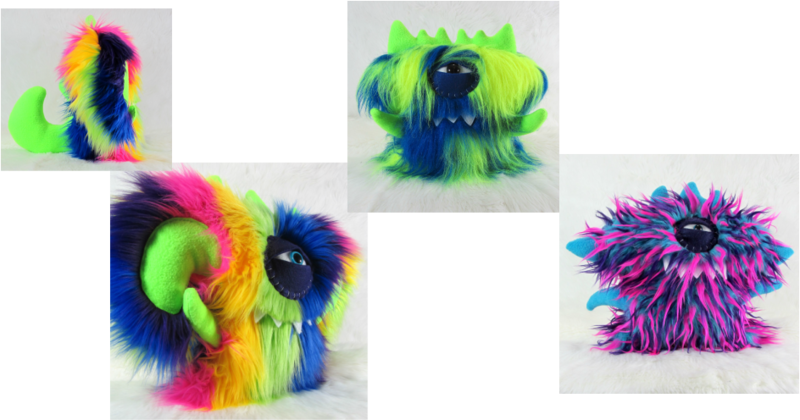 Measuring 66 inches long by 3.5 inches wide they are made of amazing multi-color, long pile faux fur, and flannel. This scarf will keep you warm year-round. The body of this monster was machine sewn with love. 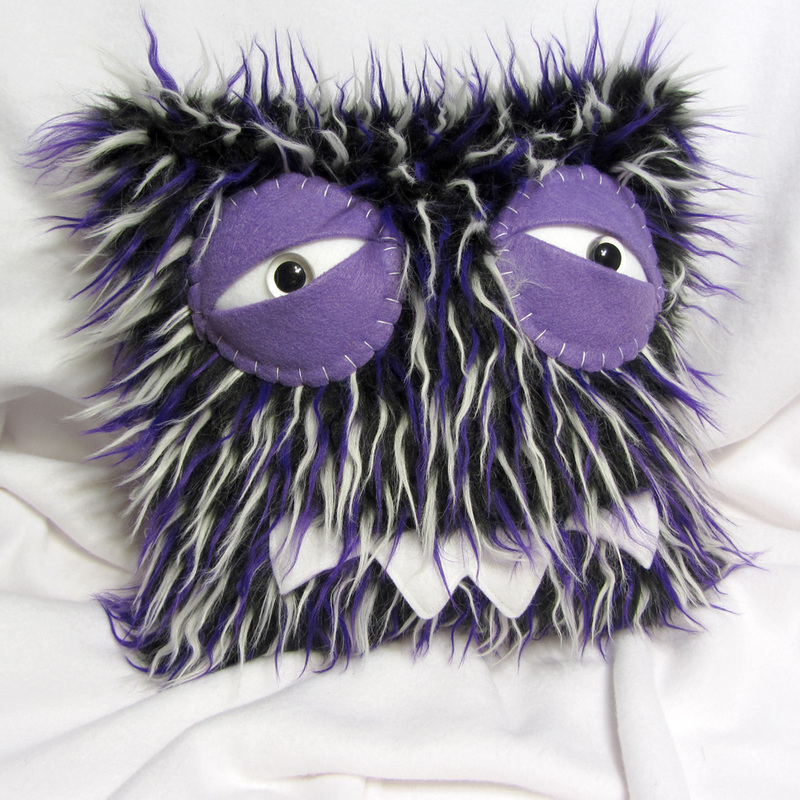 The safety eyes are attached to the whites of the eyes which are machine sewn to the body of the monster with the eyelids being hand sewn with heavy duty thread. We will be adding our entire line to this page. There are more monsters that are already available, are about to be revealed, and yet to be created. Come back often to see all the new happenings in the world of Bearmojo.